I’m using Mr. Trump’s definition. Trade deficit overall (NIPA definition) and bilateral with China both increasing. Note that not much progress is apparent even if normalizing by GDP. 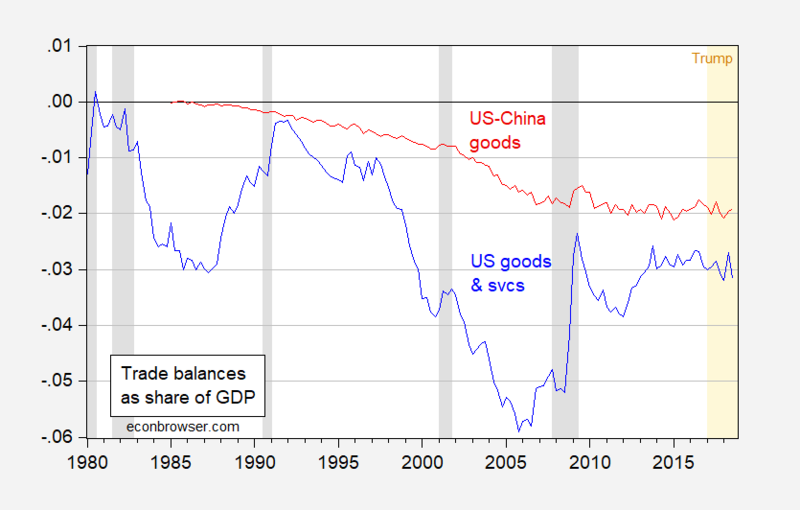 Figure 2: US net exports (blue), and US-China goods trade balance (red), both as a share of GDP. Net exports NIPA definition, SAAR. US-China is difference of monthly series seaonally adjusted using X-13. NBER defined recession dates shaded gray. Trump administration shaded orange. Source: BEA, 2018Q3 2nd (preliminary) release. What about Mr. Trump’s favorite — even if irrelevant — measure, that is the goods trade balance. That too is deteriorating. 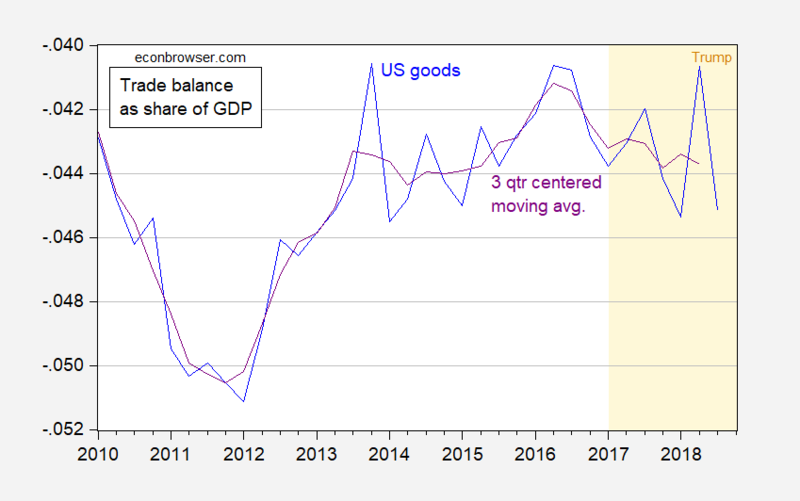 Figure 3: US goods net exports (blue), centered 3-quarter moving average (purple), both as a share of GDP. Goods net exports NIPA definition, SAAR. Trump administration shaded orange. Source: BEA, 2018Q3 2nd (preliminary) release. This entry was posted on November 28, 2018 by Menzie Chinn. This latest news is shocking. When did businesses start moving jobs to where labor, parts, intellectual capital, and inputs are the cheapest?? Hmmmm, what a “revelation” in free markets and capitalism, that’s a completely “new one”. To bad John Maynard Keynes and Milton Friedman never lived to see that!!!! Never mind the great Jewish economist David Ricardo ever seeing such wild ideas as capital movement. What simple men they were compared to donald “The Great Inheritor” trump. Hmmm, maybe trump will have to drop another bomb so soybean farmers and GM workers can feel happy about working at McDonalds now?? Well, we have some commenters here, who have extremely poor reading comprehension reading a 3 page WSJ article about Huawei, who think cell phone towers and 5G networks are the same thing as smart phones—so those 2 commenters are going to be shocked to find out that donald “Orange Excrement” trump could care less about Apple. Let’s see if the two commenters with horrid reading comprehension can manage comprehending Youtube videos here, shall we?? Maybe there’s a function on Youtube where we can slow the video down so they speak slowly?? Ok, dumdums, once again, the USA government negotiations with those countries related to Huawei, had nothing to do with smartphones and everything to do with telecommunications equipment and infrastructure. Thanks for playing “Can a 5th Grader Comprehend a 3-page WSJ article???”. Always good times. fancy a country with a structural budget deficit of 6% of GDP and interest rates at perhaps normal having a trade deficit. Imagine consumers and companies buying up imports. Trump’s gut says we are winning. Oh wait – Trump stole Stephen Colbert’s intellectual property! The U.S. consumer is the engine that is pulling the world economy and fortunately consumers are spending their money. 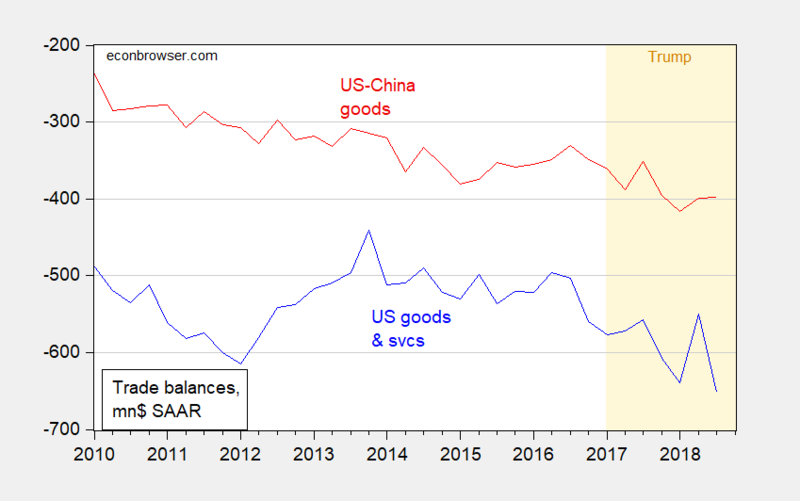 The trade deficit is getting worse because Trump has decimated agricultural exports and many other export products with his nonsensical trade war that we are obviously losing. Oh, my. Today we have Trump’s personal lawyer and bag man Michael Cohen swear in court that he lied to to Congress out of loyalty to the President when he said that Trump had no financial dealings with the Russians. Well, maybe not so hilarious, since it means we have a lying psychopath in the White House. Even funnier was Rudy G’s reaction. Rudy rushes out and says in Trump’s answer to the Mueller questions that Trump said the same thing that Cohen said. So Trump told the truth according to Rudy. But then Rudy turns out and says Cohen lied. WTF? Has The Onion taken over Rudy’s brain? You ever get the feeling there’s some kind of a George/Tony thing going on there with Rudy Giuliani and Orange Excrement?? Well, “Tony” already told Michael Cohen to “step off”. When will he tell Rudy to “step off”??? Rudy won’t be able to defend trump in court, Rudy is half-senile already and he never had that tool-kit to begin with. So the new Kudlow spin is going to be that the rise in the government deficit was designed to get rich people to save their tax cuts! Good to know! A guess those fans of Barro-Ricardo are having a nice chuckle.